Open courses are an off-shoot of the digital humanities that combines in-class instruction with an open source sensibility. Schools including MIT and Yale provide some courses through their open course or open course ware portals for anyone in the world to learn from the lessons of their faculty. However, the tradeoff is that learning from an open course does not provide you the credit that you would otherwise receive from participation and in-class work (e.g., tests or writing papers). Nevertheless, open courses are a valuable tool for learning new ideas and concepts that you can put into practice in your own work. Also, they provide a great refresher for ideas that you may have already encountered in your own studies. Open courses also provide benefits for the hosting institution and the lecturing professor. Providing free knowledge spreads the ideas promoted by the institution. The lecturer elevates his prestige in academic circles by disseminating his or her ideas through open courses. For the ideals of open courses, those institutions and lecturers who make this material available further the goals of openness, community, and sharing by providing high-quality education for anyone with the means and motivation to learn from available open courses. Yale University has an impressive list of offerings in English Studies here. 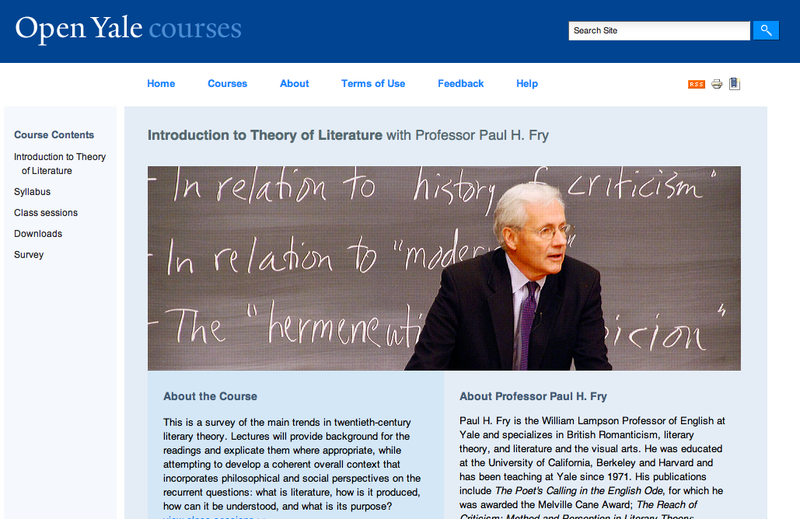 Lately, I have been listening to Professor Paul H. Fry’s Introduction to Theory of Literature through iTunes University, but you can access his classes through the Open Yale Courses website here (find transcripts, audio, and video of each lecture there). In particular, I enjoy Professor Fry’s elementary approach to critical theory. Throughout his lectures, he critiques “Tony the Tow Truck” by Robert Kraus using the tools of each theoretical approach. This approach makes it easier to see the workings of theory when the object of study is not as complicated as say Ulysses or Gravity’s Rainbow. Students learning from his pedagogical approach, I believe, would be more well versed in the tools made available to them and can then apply those tools to the more complex works of literature that they would likely study.